With over 30 years of experience developing and delivering sorting solutions, Compac holds a special position as the world’s leading sorting solution provider. But what exactly goes into creating a sorting system that enhances the brand of growers and packers, provides a good return on investment, and stands the test of time? In the ‘Sorter-behind-the-scenes video’ we answer that question as we look at the crucial elements for packhouses to consider when choosing their solution. The video also explains what happens at Compac and how our team continue to improve and future-proof sorting solutions for our customers. What goes into developing industry-leading sorting and grading technology? When choosing a sorter system the key considerations for packhouses are reliability, consistency, accuracy and speed. The ultimate goal of a sorter is to provide ROI for both growers and packhouses, which means listening to customer feedback and consistently improving solution performance and customer experience. Ensuring the fruit arrives at retailers in the highest quality possible is key to strengthening a brand and maximizing returns to growers. We have invested in developing sorting solutions that focus on gentle handling while maintaining throughput. For example, the sorting lines used in the apple state of Washington have been designed wider and more accommodating for the fruit. The lines also incorporate brush bristles to gently decelerate and handle the produce in a gentle manner, avoiding any bruising. The lanes include propriety technology to prevent fruit on fruit impact that can occurs during the sorting and grading process. 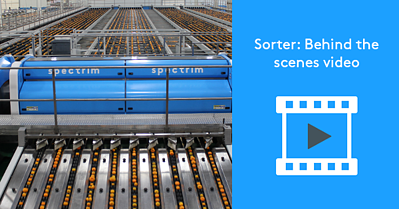 Adopting a robust sorting system like Spectrim into a packhouse environment helps to ensure growers, packers and retailers alike have their brands protected. In the unfortunate event of a recall due to contamination, Spectrim’s systems record every piece of produce going through the system and then integrate with packhouse management systems through Compac’s Sizer Software. This allows for packers to identify what batch the affected fruit came from and begin the recall process without causing major disruption to the packhouse and ongoing operation. Food safety is of the utmost importance for Compac, in 2010 we founded the Food Trust team with the goal of looking at industry regulations and deep dive into how customers were really using the sorting systems. The Food Trust team helps to ensure every Compac product is not only compliant with the rules and regulations stipulated for the fresh produce landscape but are also easy to clean and sanitize. When a packhouse experiences downtime for any reason, this will begin to affect the bottom line through the loss of productivity. One often overlooked instance of this is maintaining top hygiene practices in the era of the 365-day supply chain where sorting and grading systems can be running for 24 hours a day. The Compac Sorters and Spectrim system have been designed to minimize planned downtime by being easier to clean – providing profits for both packers and growers. We also provide cleaning and sanitization guidelines to assist customers in the creation of their own packhouse cleaning and sanitization procedures (SOPs). Every customer’s needs are different, so it’s important the sorting system they adopt is tailored to their individual needs. The Compac MLS and Spectrim inspection system have been developed as a modular system that can be optimized to cater for each packhouses changing requirements. From small family-owned and operated businesses to large multinational corporations, Compac’s systems can be tailored to each packer’s scale and goals. Furthermore, our modular design ensures that packers are future-proofed against the ever-changing face of the fresh produce industry. Meeting customer demands and providing the highest quality produce to retailers is the goal for Compac, and their range of sorting and grading systems aim to integrate with any packhouse set up. For more information on Compac’s sorting solutions, watch the behind the scenes video here and get in touch with a sales representative.